What differentiates specialist hifi with that of the mass market is sophistication in design. For one, it is at the heart of its being. For the other, no more than the emperor’s new clothes. From this perspective when choosing your home music companion, opting for a trustworthy company that has design as their foundation ensures a happy outcome. Tivoli Audio is one such company and their Music System BT is a fine example of sophistication in design. 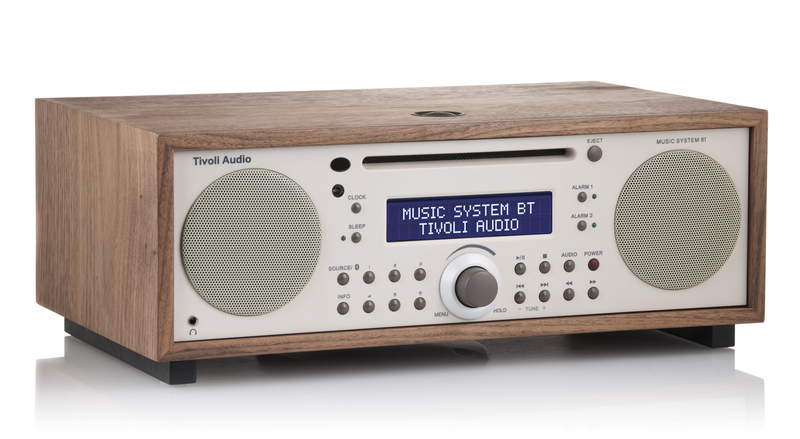 Tivoli Music System NZ $1,495 including GST and delivery. Online Shop. The Tivoli Music System is an all-in-one design which succeeds in all aspects important for your enjoyment – performance and reliability, flexibility and ease of use, it is stylish and robust. Simple, elegant, affordable. Read on to find out more about why the Tivoli Music System could be just what you’re after. Or contact us. The Tivoli Music System is a one box music system (dimensions mm: 133H x 358W x 241D), housed in a designer wood cabinet that plays CDs and radio. Through it you can also play music from Bluetooth enabled digital devices, eg iPhone. Plus it has an auxiliary input with which you can listen to other music sources such as a turntable. The built-in room-filling sound comes through a stereo pair of speakers and down firing subwoofer powered by amplifiers which give a full, detailed sound. The Tivoli sound is recognised as warm and rich. So you can see the Tivoli Music System is well thought out. Its design is directed towards putting out great sound with pleasant to use features. One of these features is the slot CD player. If you have a CD collection its nice to simply slide your chosen disc into the smooth loading slot and enjoy. With the Tivoli Music System you therefore have the convenience of CD as well as up-to-date music listening technology with Bluetooth. Plus of course, radio broadcast. Superb radio is what earned Tivoli their reputation. Very few compact systems include CD, Bluetooth and Radio, let alone an extra input to give you a fourth source. Isn’t it nice to own electronics that have the features you want but without complication? Zoom in on the image and you’ll see Individually labeled buttons which take you to the ssource you want, control volume, and yes, the dual alarm clock. You can control the CD player and go to radio stations you’ve pre-set. Instructions for setting your radio stations and alarms are straightforward to follow. The Music System has an easy to read display. ‘RDS’ in the display will show CD and radio information, (Radio Data System is a communications protocol for digital information). There’s even a headphone connection for personal listening. You’ll find other thoughtful aspects to the design such as the ‘AA’ battery fitted in the back which keeps the clock functioning in times of power outage and maintains trouble-free operation. The look of the Tivoli Music System is a little bit retro. The wonderful a thing with this timeless styling is that it fits into all decors. It also recalls its heritage. After all Henry Kloss who designed the original Tivolis is known for his superior radios of the 1960s and there is a lineage from then to now. The Tivoli Music System is perfect for those who are looking for a music playing system that takes up minimal space but doesn’t compromise sound quality. It is suitable as a secondary system for the office, bedroom or holiday home but is more than competent to take a place in your living room as your main listening system. Tivoli Music Systems we’ve sold function in all these scenarios delighting their owners. Much of the sound quality can be attributed to the solid construction, including the trade mark furniture grade wood cabinet. Think of the Tivoli Music System as a loudspeaker and it starts to make sense – carefully chosen drivers – including a down firing subwoofer, housed in an solid and well damped enclosure. The internal amplifiers are dedicated to these speakers, so you effectively have an ‘active’ speaker system (active loudspeakers are associated with some high-end speakers that have built-in amplifiers optimised for each driver). That’s exactly what it sounds like – detailed and controlled, with a sense of scale that belies the box size. There is a bit of smart audio manipulation in there as well. With a normal stereo you would place your two speakers some distance apart. To compensate for this Tivoli’s ‘wide mode’ gives a spacious stereo sound. Because not all bluetooth is equal its good etc know that Tivoli’s Music System uses Bluetooth wireless technology’s advanced A2DP profile for high-quality audio. If we tried to put together a selection of separates to do the same things for a similar price, we can’t even come close – and thats before considering the quality performance of the Music System. We also see the Music System as the antidote to TV – music, information and entertainment all available anytime you want and if you are part of the ever growing National Radio demographic it’s commercial free. Music 101 on Saturday afternoons sounds particularly good via the music system – it’s got the capabilities to make the most of live recordings. And there is nothing to stop you connecting your laptop to listen to any of the podcasts of programs that you might have missed. Classical listeners will love the rich tone of the Tivoli when tuning into the Concert program. The look isn’t a million miles removed from a 50s radiogram and you may appreciate the feeling of transporting yourself back to a simpler time. Online Shop. Edit "The Tivoli Music System BT"